Every year, there are two books that I re-read, at different seasons. At Christmastime, it’s Sir Gawain and the Green Knight (a poem, but the size of a book) because it has end of old year and start of new year themes. 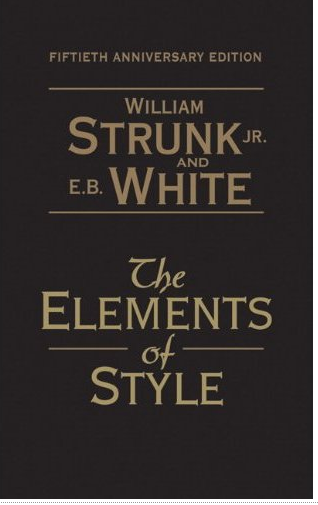 At back-to-school time, I re-read Strunk and White’s The Elements of Style. This post tells a bit about why. I’m a bit of a language geek. I think about it a lot in my spare time. I enjoyed diagramming sentences in 8th grade, and I wrote my honors thesis for undergrad on Cajun French morphemes. Words matter to me, and putting them together smartly, in particular in the business world, is the difference between grabbing or losing an important person’s attention. I write for a living, so for me it’s a practical matter. And it’s just plain enjoyable for me to read this tightly written book about being a better writer. Rather, very, little, pretty–these are the leeches that infest the pond of prose, sucking the blood of words. The history of the book is also worth knowing. Many don’t realize that E.B. White (author of Charlotte’s Web) kept the book alive “with” his Cornell professor William Strunk Jr, albeit after Strunk had passed. Professor Strunk wrote the book for his English undergraduates in the early 1910s, and White was one of them. Years later, the publisher Macmillan asked White to re-work the book for more widespread use, and White stayed true to the “little book” that Strunk created. The first edition was published in 1959, and since then there have been another four additions, each containing updates that keep it current. Use definite, specific, concrete language. Nice: A shaggy, all-purpose word, to be used sparingly in formal composition. Write in a way that comes naturally. Vigorous writing is concise. A sentence should contain no unnecessary words, a paragraph no unnecessary sentences, for the same reason that a drawing should have no unnecessary lines and a machine no unnecessary parts. This requires not that the writer make all sentences short or avoid all detail and treat subjects only in outline, but that every word should tell. “Tell,” indeed. Every piece of writing should tell a story without “unnecessary” embellishment. What’s the point? The best writing is created from the heart but polished by the discipline of the mind. I am now cross-blogging. Note that this is not the same as cross-dressing. Check out a series I’m doing for Executive Elements, a new blog that focuses on building successful female leaders. Executive Elements Partner and Executive Coach Chasity Kuttrus is a force. I encourage you to subscribe to this blog, not just because of me but because of its quality and substance. My series of posts is on “mentorly love” — focused on how female and male mentors complement our professional growth. In the series, I’m defining a couple of mentors on my personal “board of directors.” These folks have given me the support and push that I’ve needed along the way, like professional moms and dads. Scrap riots sound like fun...c'mon! 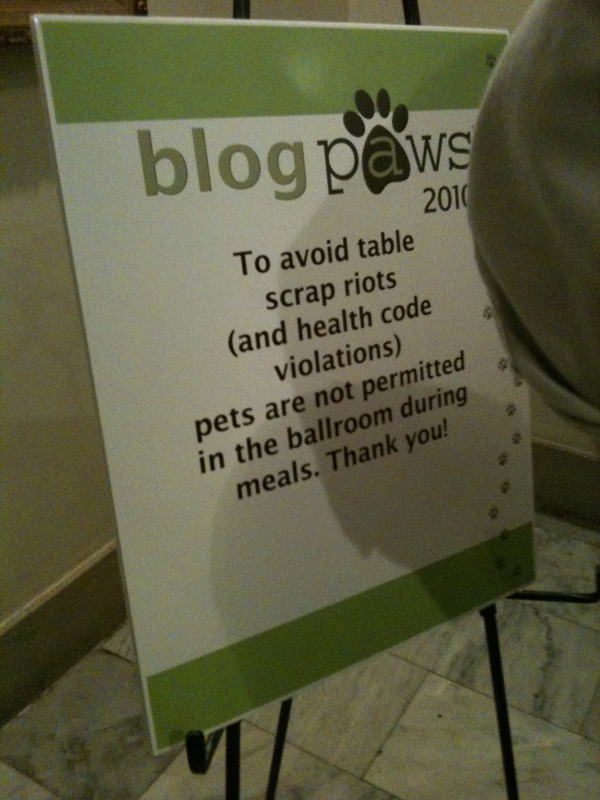 Had an awesome time at the Blogpaws pet bloggers’ conference yesterday and today! Thanks to all who attended the Building Your Blog Strategy panel, moderated by Sue Resnicoff of Del Monte Foods | Pet Products. (My pet’s favorite: Pup-Peroni.). I enjoyed sitting with fellow panelists Karen Nichols of Catster blog and Michele Hollow of Pet News and Views. Ideas and tools for creating and sharing compelling content. Tips and techniques for staying disciplined, engaged and most of all, motivated! Research the topics that are of interest to you AND your target audience. Conduct a thorough search effort when you get started…and at logical check-points. Ask around and look for content “holes.” Is there a topic that’s not being blogged about? Is there value you can add to the discussion from an unexplored perspective on a topic already in the blogosphere? I will often share content on Facebook and Twitter that is of interest to me, then blog more deeply about the content. This is a good way to test initial responses to the topic and determine whether it would draw readers to your blog. Setting up a series of posts about a topic also gives you the chance to touch on the high points and dive deep over time. Posts should be no longer than 400 words. Preferably, make them closer to 250. Add images, audio and video. Keep in mind the needs of visual and experiential learners. Not everyone will be drawn in by the written word. 1. Discipline: Create an editorial calendar. This will help you to plan your posts across the year and have a roadmap for success. Remember to set realistic goals for frequency. Start off modestly and build out to one or more posts per day, as it makes sense for your blog. Don’t be constrained by the calendar. You can and should be posting more frequently on topics of current interest. 2. Engagement: Build relationships and activate your voice…enhancing your reputation. Building relationships is the goal. Get excited about your content. If you are passionate, your readers will be. Be smart about your content and your replies to readers. Comments and replies should be dynamic extensions of your posts. Learn how-to’s from industry leaders, including their mistakes and successes. Assess your reader demographics. Are they your intended target audience? Attract and retain your target readers. Recalibrate your calendar on a regular basis (monthly or quarterly). 3. Motivation: Don’t go it alone. Bond with fellow bloggers. A support group will keep you activated. Get honest reactions from your friends, family and significant other. Take a break when you need to. No one will smack your hand for skipping a week when you need to take a breather. A blog vacation can rejuvenate your energy and help to grow new ideas. I thought it would be appropriate to post this shot of Wylie post-conference. He got loads of new toys (more info in future posts) and was EXHAUSTED by the conference. He took networking to new levels in the pet play room while I presented. But everyone has to sleep it off when they overdo, right? Are you interested in pets and blogging? Join me for this conference in Columbus, Ohio, April 9-10, at the Westin downtown (pet-friendly hotel!). More than 250 bloggers, writers and companies passionate about pets will come together for networking, learning and fun. The best part? You can bring your animal with you. 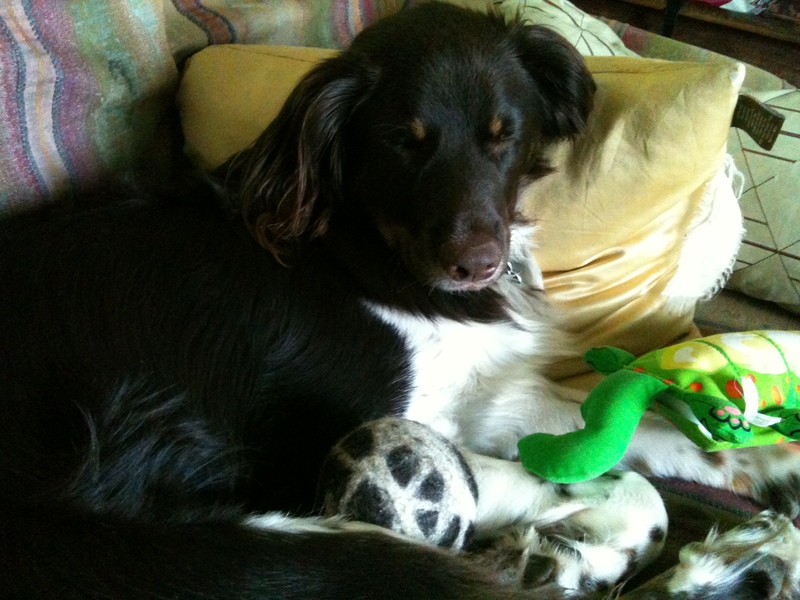 Wish me luck…I’m on a panel for Building Your Blog Strategy, and the puppy will be joining me. We’re involving in Columbus All-Breed Basic Obedience starting next week, which should help us out tremendously. Meanwhile, let’s hope that he doesn’t have to wear his Elizabethan collar to the conference. It’s not very stylish. Wylie’s currently recovering from a pad injury. What’s that sucking sound? It’s the sands of time, the ticking clock and and my unfinished to-do list — all being eaten whole by Facebook, Twitter and my blog. I have succumbed to the time-sink of social media, and I’m all too keenly aware of my addiction. How do people draw the line between true engagement and online time-wasting? It’s a difficult habit to kick when it partially drives the economic engine of my professional livelihood. Working in public relations, I feed the beasts of my own personal social media presence as well as my agency’s and certain clients. I was recently asked a question about this on a panel. The question was: How do you find the time to “do” social media for yourself and clients? Doesn’t it take up all of your time? The answer? It can if you let it. The best way to carve out the time is to set limits on how much time to devote to each social media footprint. The worst thing for me is to leave my time wide open. When I do that, I get caught up in “the zone,” or my “flow” space, where I lose all track of time. This is fairly self-indulgent for me—although it feels good in the moment, I can’t usually afford to let my time evaporate. I’ve got a family to get home to, client deadlines to meet and other normal life to-dos. I try to spend 30 minutes on each Twitter account per day, 15 each in the morning and the afternoon or evening. With the blog, it’s a couple of hours a week. Just one post a week, usually. And then I’m reading others’ blogs through my reader, usually an hour a day. Then there’s Facebook. How much sharing is enough, really? I try to limit myself to sharing just a few items per day of others’ content, with a couple of status updates and/or content of my own. This one is my real weakness, because I pore through information obsessively and tend to think that everyone should also ready the cool stuff I’ve come upon. This is where I have to reign myself in and exercise some judgment about not oversharing. There are people I’ve friended that I filter out of my feed because they are constantly putting up stuff from third-party sources. To me, that’s as bad as someone telling me the minute details of their life second by second. Get original. Have your own thoughts and insights. It does add up, all told. At least 10 hours a week for myself, probably another 15 or so for work-related items. When examined like this, the opportunity cost of social media becomes more stark. What real-life experiences am I missing due to social media interactions? How much outside time am I sacrificing? What are others’ experiences? Amber Naslund, Director of Community at Radian6, just put up a good post about time management in the midst of social media. Bottom line, it’s about knowing one’s goals and setting priorities aligned with them. She shares helpful information to guide social media priorities. For me, it’s all about the balance. Easy to write about, not easy to strike! So many self-proclaimed social media gurus are full of it. They confuse quantity with quality, and juvenile behavior with “authenticity.” Use of social media does not equal expertise in leveraging the medium for business purposes. These days, there’s a fair dose of snake oil being peddled by people seeking to make a profit. Business advisors encouraging companies to hire a “social media expert” lead to further confusion, setting aside real strategic decision-making for reactive jumping-on-the-bandwagon. Just because someone’s using social media doesn’t make them a go-to for solving business problems. This is like saying that because a person can dial the telephone and talk with every friend in an afternoon that they are an expert in sales. It just doesn’t work that way. Take a look at their design aesthetic. Is the color palette of their blog reminiscent of the choices you would have made as a teenager? Just because you can make your blog header bright pink doesn’t mean that you should. Appearances do matter, and this is a signal that they are not playing to a business demographic. Taste is not something we’re all born with. Most of us develop it over time, through trial and error. Read their blog. Does it include self-promotional and narcissistic photos and a minimum of useful content, primarily focused on their drinking exploits? Is there a preponderance of lol, omg and cul8r? This is self-absorption that they’ll mature out of, but you probably don’t have time to observe the process of growing up. Let them interact with the newbies in the industry and pay their dues before they get credit for being a “guru.” Experience counts. Come back in 5-10 years. How much content do their tweets deliver? If they are mainly flirting with people or trash-talking with friends, this is another reason to filter them out. Sharing information is key on social media, but being mindful of what’s worth sharing is the “twetiquette” to live by. Some do not switch gears to DMs when a one-on-one conversation is started on Twitter, and that’s a shame. Knowing when to go off-line or on a private line is a judgment easy to make and honestly appreciated by the Twitterverse. A high frequency of tweets does not get one access to the ranks of the Twitterati. Is their point of view “authentic” in a style that can be converted to play in a business setting? The beauty of social media is each individual’s ability to establish a uniquely authentic voice. Just as all voices are not welcome at the board table, not all social media voices are worth tuning into for business purposes. Being authentic in the business world probably does not include over-use of emoticons, IM abbreviations or stream-of-consciousness chatter. High-quality tweets consolidate big ideas, embedded in tiny urls and spartanly precise word choice. They are mini-headlines that when mined open new worlds for the reader. Remember, there’s a “me” in social media, but it comes after the “social”–meaning that awareness of social standards is still good sense and good business. Question for Readers: A Contest? What would you think of a contest on the blog, for a free subscription to a leading business publication? I’ll do it based upon your feedback, so speak up.